The “Anti-Griddle” is a traditional cooktop with an amazing twist: the device quickly freezes sauces and purees instead of heating them. 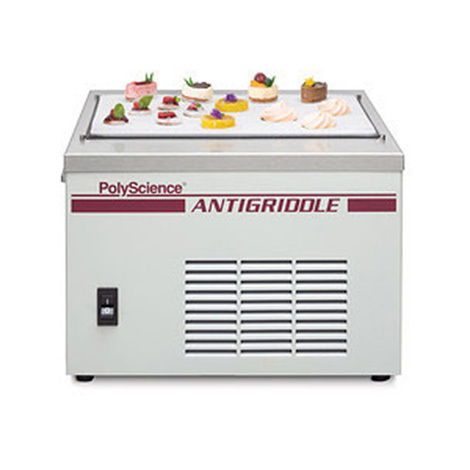 This unique innovation allows you to effortlessly freeze sauces and purees solid or develop semi-frozen creations with stable, crunchy surfaces and cool, creamy centers. The tantalizing dual-textures help satisfy increasing consumer demands for new dining experiences. Let your culinary imagination run wild! Quickly freezes sauces and purees into solid, unique forms, or freezes just the outer surfaces while maintaining a creamy center. Minus 30°F ‘griddle’ temperature ensures almost instantaneous results. Approximately 1 square foot high-endurance cook top provides an ample, easy-to-clean work surface.